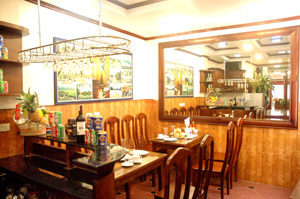 You would have a perfect retreat from the hustle and bustle of Hanoi's streets. A la Carte menu and our lunch feature a variety of International and Vietnamese dishes. Hanoi Street Hotel bar offers seasoned travelers and businessmen the perfect venue to meet friends and business associates in a refined and intimate atmosphere. Combined with wines and cocktails from around the world with soft music. This Lobby Bar & Lounge makes for a wonderful place to relax. This restaurant equiped for High Speed Internet Access.